I am finally starting to feel somewhat normal again! Praise the good Lord! :) The cravings are beginning which I'm totally fine with since I feel like I haven't eaten well in 6 weeks! I still haven't forgotten about my post on answering your questions...it's in the works. For real, like, I haven't done a thing on my computer in about 6 weeks so hopefully this weekend I can get back on track and get some units on and some FREEBIES!!! 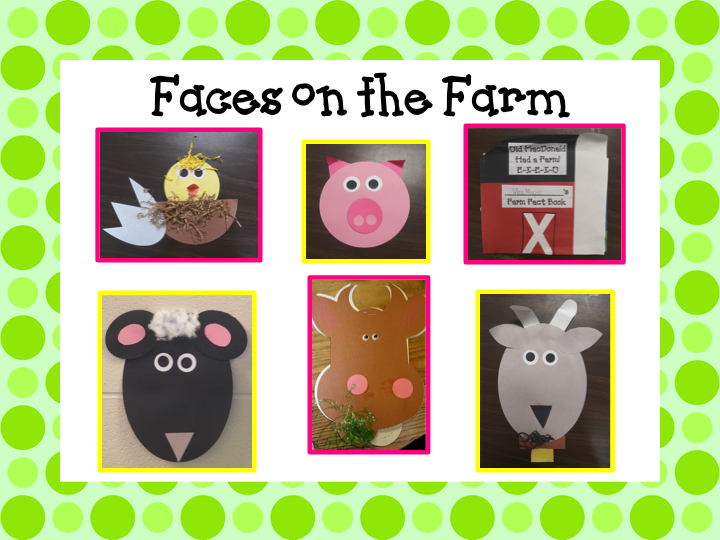 I'm still without a camera so I don't have pictures of what's been going on in our classroom, but I have a slide that Jamie Mayas made of the Farm Faces we have been working on this week. So cute! :) You can find all of the patterns, directions, and facts here! I am so glad you are feeling better. Take it easy and take care of yourself. Okay, I sound like your mother but you have a lot on your plate right now! I am glad to see you back in the land of blogging. So glad you are doing better! Missed ya! Glad you are feeling better!! Missed reading your posts! I am so glad to hear that you are starting to feel better. The blog world has missed you. Please take care of yourself and your sweet growing family. Glad you are back! Glad to hear you are better (and eating - that's always the best part of being pregnant!). We have all missed you so once you are 100% we can't wait to see what's next! Take care of yourself and your little one (to be!). it was great to see a post from you. I have kept you in my prayers. So glad you're feeling better. I will be watching for what you make next. Those are so cute! Glad you are getting back in the swing of things! so good to hear you are feeling better! have a great Easter! I love how you used that green grass basket stuffing for the cows grass to chomp on. Great idea! Oh my goodness! LOVE these...I will have to go buy some for our upcoming farm unit :) Have a very Happy Easter!! I have read a few of the articles on your website now, and I really like your style of blogging. I never thought I could have a good read by this time until I found out this site, It’s have been trusted by many individuals and business organization, it’s a open source management system and its codes are easily available for modifying and using.